George Poveromo, who resides in Parkland, Fla., is a nationally-recognized sportfishing authority who serves as Editor-At Large for Salt Water Sportsman magazine, and the producer and host of his own television series on ESPN2: George Poveromo’s World of Saltwater Fishing. I love bottom fishing. The thrill of lowering a bait to the ocean floor, feeling those “pecks” and “nibbles,” and anticipating if that very next bite will nearly jerk the rod from your arms is something to behold. Then, of course, there’s the ensuing slugfest once you do hook up with a trophy fish. 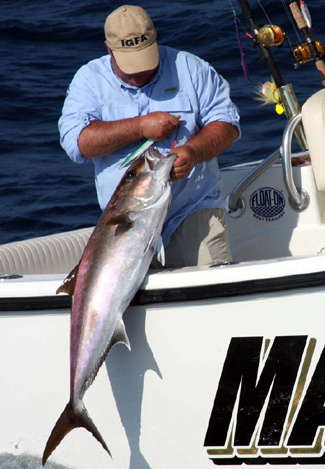 Dr. Ken Neill III prepares to release one of several amberjack he caught aboard the MARC VI. Most of my bottom fishing is practiced off South Florida and throughout the Bahamas, in depths from 30 to 100 feet. When I learned about the impressive catches of bottom fish off Virginia Beach in depths between 300 and 600 feet — without electric reels, I wanted to give it a try. So much so, that my Mako 284 center console, MARC VI, was shipped from South Florida to Virginia Beach’s Inlet Station Marina, which is just inside Rudee Inlet. I was set to fish with Virginia Beach angling legend Dr. Ken Neill III. Ken is a practicing dentist. When he’s not at his office, a good place to look for him is along the western edge of the Norfolk Canyon, where he’ll likely be “drilling” the bottom fish on conventional hand-crank reels. These deep-dwellers include tilefish, grouper, wreckfish and several other “strange” species. To say that Ken has a handle on this fishery would be an understatement. The tactics he has learned and perfected have resulted in several world records. He knows his way around this bottom very well. Ken and I boarded my MARC VI and headed some 70 miles to the edge of the Norfolk Canyon. Out here, I dialed in the map on my Lowrance HDS 10 unit, so we could study the bottom as we approached the GPS coordinates to some of Ken’s more productive spots. The plotter trail was also activated on the Lowrance unit, so our drifts in relationship to the bottom structure would be clearly displayed on the screen. The goal was to make a drift or two over a section of bottom, catch a few fish, and move on. As mentioned earlier, we brought no electric reels, which are a mainstay of the deep-dropping fraternity. Instead, we relied on traditional hand-crank reels and rods to get the job done sportingly. Our outfits included Penn Torque 300 reels, paired with six-foot long, Penn rods rated for 50- to 100-pound test lines (model VS5010TS60) and also 5-foot, 8-inch long, Penn Torque Jigging Rods rated for 80- to 130-pound test lines (model TJ8013C58). To cut through the water with minimal resistance and enable us to reach the 300- to 600-foot depths without excessive weight, a couple of the reels were filled with 80-pound test Sufix Performance Braid, and a few more were filled with 65-pound test Sufix Performance Braid. Braided line has a very thin diameter and no stretch, a must when fishing this deep. The terminal set-up was basically a two hook Dropper Rig fabricated with 80-pound test monofilament. The offset, ring-eye hooks ranged between 4/0 and 6/0 in size. A small green tube rode over the eye of each hook, with a green glow bead on top of each tube. A bank sinker between 12 and 24 ounces was attached to the bottom of the rig. Chunks of fresh bait were placed on the hooks, and sent into the abyss. Ken Neill, with the hometown advantage, scored first. He wound tight on a strike, and I watched the tip of his rod bend rather impressively. I was excited over the opportunity to see what he dredged up from the deep. I waited, waited, waited, and waited! Unlike traditional bottom fishing in depths of less than 100 feet, where the fish usually comes up in less than a minute or two, this bottom denizen was being winched up from 400 feet of water. Patience and elbow grease are the keys here, and, as I discovered, it would take a while before I would see Ken’s beautiful Blueline tilefish! A cold current had definitely moved these fish off their spots, as Ken and I struggled to locate them. This is not to imply that the action was slow, it wasn’t. The various species — like wreckfish, snowy grouper, Blueline and Golden tilefish — however, just weren’t around in the numbers and sizes Ken has grown accustomed to catching. Nevertheless, we pressed on and began building a decent collection of Blueline tilefish. At one point, Ken hooked what he believed was a larger Golden tilefish, only to pull the hook during the initial stages of the fight. The humorous part of the trip came when we hit a vein of big Conger eels! It seemed, at one point, that whenever we dropped to bottom and hooked up — it was a Conger eel. If reeling up such a “disappointment” from 400 feet of water isn’t frustrating enough, try taking a Conger eel off the hook! I even went as far as to score a Conger eel double header (two fish on the same line), a “thrill” surpassed only by trying to take them off the hook. One of the things I respect about Dr. Ken Neill is his commitment to marine conservation. Because of the pressures associated with reeling up a fish from such depths, all but the Conger eels die; The gas bladders and other internal organs in the tilefish and groupers expand or burst. Release fishing is not an option out here. Ken Neill fishes until he accumulates enough meat for some fresh dinners, then he leaves the fish. Such a mind-set is critical for maintaining this newly discovered and apparently healthy deepwater fishery. Dr. Ken Neill III and George Poveromo display some Blueline tilefish they caught by dropping along the edge of the Norfolk Canyon. After getting our belly full of deep-dropping, we decided to head some 50 miles south of Virginia Beach, to a tower where Ken said the amberjack usually abound in unbelievable numbers. Early one morning, we made that long run, and I’m glad we did. When we arrived, the screen on my Lowrance fishfinder turned red with fish markings. We looked over the side and saw hundreds of big amberjack. This was going to be too easy! We used the Penn Torque reels spooled with 65-pound test Sufix braid, and then tied on several feet of 50- and 80-pound test fluorocarbon for leaders, followed by a Williamson Benthos jig — a heavy, elongated “wobble” style iron. Ken dropped down first, got a couple hits on the fall, and then hooked up solidly before the jig made it to the bottom. After a tedious fight, we released our first amberjack. Ken and I swapped turns catching amberjack on these jigs. 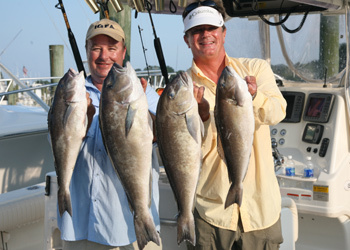 The tower was loaded with amberjack and catching them was as easy as dropping down a jig and radically working it. These fish were so solid and aggressive, I was convinced I could get one to eat a top water plug. I picked up my baitcasting outfit (a Penn International 975 spooled with Sufix 30-pound test braid), tied on an 80-pound test fluorocarbon leader and a 5-1/4-inch long, Rapala X-RAP WALK topwater plug (color GGH — Glass Ghost). I pitched out the plug and began working it fairly quickly across the surface. The first few attempts drew no response, but once I threw again at a school of fish, it was a different story. A big amberjack charged up behind my plug and lunged at it. However, the wake from its head pushed the plug off to the side, and the amberjack missed it. I kept working the plug and the fish came back to it. It eventually caught the plug, and the fight was on! What a strike! And what a battle on that light baitcasting outfit. After a spirited fight, Ken subdued the fish with a release gaff. I removed the lure, admired the catch, and released it! Virginia Beach has a lot going on, fishing-wise. My bottom trip with Ken showcased some of the options found way out deep and also over the shallower, traditional bottom-fishing areas. There are fish here, a lot of them. And the good thing is that quite a few of them like to play. Just ask the amberjack that ate my topwater plug! For more on “George Poveromo’s World of Saltwater Fishing,” visit www.georgepoveromo.com.